Explanation: A comet has brightened quickly and unexpectedly. Discovered last year, Comet C/2014 Q1 (PanSTARRS) is expected to be visible now for a few days to the unaided eye, just after sunset, from some locations. The comet rounded the Sun on July 6 and apparently has shed quite a bit of gas and dust. Today it is now as close as it will ever get to the Earth, which is another factor in its recent great apparent brightness and the large angular extent of its tails. 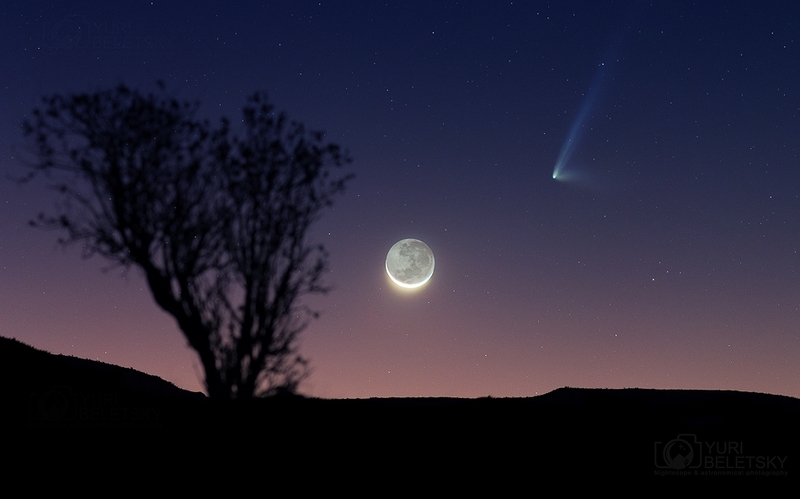 In the featured image taken two days ago, Comet PanSTARRS is seen sporting a short white dust tail fading to the right, and a long blue ion tail pointing away from the recently set Sun. A crescent moon dominates the image centre. Tomorrow, Comet PannSTARRS will pass only 7 degrees away from a bright Jupiter, with even brighter Venus nearby. Due to its proximity to the Sun, the comet and its tails may best be seen in the sunset din with binoculars or cameras using long-duration exposures.